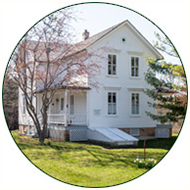 The Long Grove Historical Society was formed in March, 1974, to accept the Drexler Tavern building as a gift. A joint project with the Village Board made possible the relocation of the tavern to a site behind the current Kildeer Countryside School. Today we know the building not as Drexler Tavern, but simply as Village Hall. Two additional structures have also been relocated to this area—one of the area’s one room schoolhouses, Archer School, and a mid-1800’s barn, Ruth Barn. The school and the barn form the core of the program we run each year for our local schools, so that our children can experience first hand what life used to be like in Long Grove. Last, but not least, a mid-1800’s farm house was relocated to an area bordering the southwest corner of the Stemple Parking lot. “The Farmhouse”, as we refer to it, houses our archives, a meeting room, and several restored “period” rooms that we open occasionally for tours. In addition to maintaining the above properties and our educational programs, we actively acquire items of local historic interest for our archives and conduct a variety of historical programs for current residents. We are a 501C3 charity and receive no tax dollars – existing solely from your contributions and our own fundraising efforts. Thank you for your support! This early farmhouse, dating from the 1850’s was moved here by the Long Grove Historical Society to be used as the their archives, museum and meeting place. It is generally open only for per-arranged group tours. The farmhouse was originally owned by the Weidner family and was located on Buffalo Grove Road. The family lore is that the Great Chicago Fire of 1871 was visible from the house. The Society was formed in March, 1874 to accept an old road house tavern (Drexler Tavern) that was to be torn down. A joint project with the Long Grove Government made possible it’s restoration and use as Long Grove Village Hall. The Village Hall complex is located behind Kildeer Countryside School, just outside the downtown area. Also in this complex, is a restored one room schoolhouse, Archer School. The Society is a private 501C3 and supports the maintenance of its properties and archives through donations and fund raisers.